Move, gather, heal, and reflect in The Sanctuary, one of our most sacred spaces at The Horse Shoe Farm. Here, we gather to explore different healing & movement modalities such as yoga, meditation, sound baths, and ecstatic dance to name a few. The space serves as the home base for “planting seeds” of foundational wellness tools and as a space for transformation. Located on the highest hill on the farm, The Sanctuary offers a group event space that is directly connected to nature and the elements. 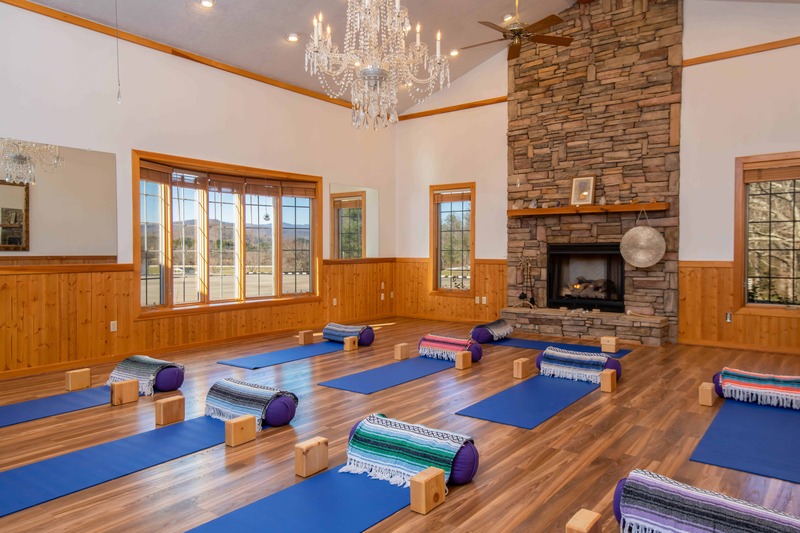 The breathtaking views of Mount Pisgah and enchanting sunsets make it an ideal location to practice yoga, host a workshop or to join in on our daily group meditations. The inviting atmosphere of the space is elevated by the unique decorative touches, like our antique Tiffany chandelier hanging in the center of the space. 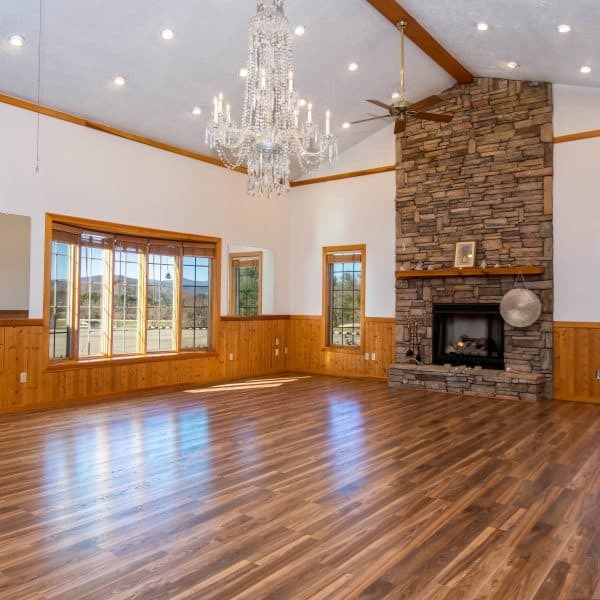 This combined with the fireplace and hardwood floors, brings a warmth to the space that is matched only by the warmth of our guests and staff. 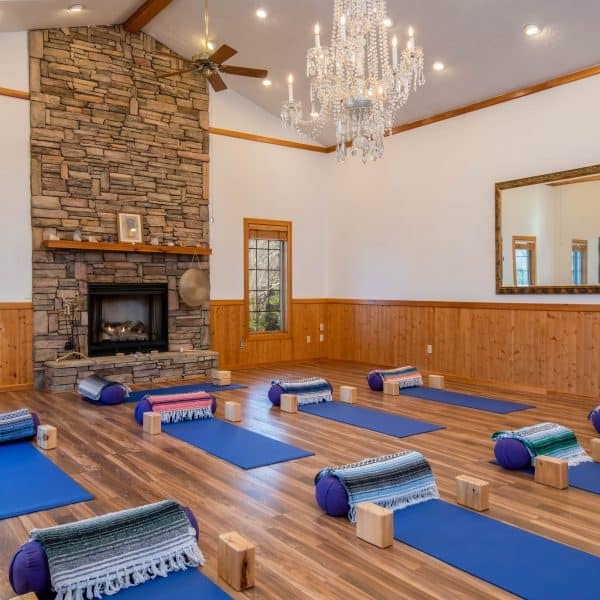 The spacious venue is ideal for yoga classes for up to 20 people and we offer a full set of equipment for all your retreat needs including bolsters, top-of-the-line yoga mats, blocks, straps, singing bowls and more. Next to The Sanctuary is the Sunset Barn, which can expand out for larger groups looking to hold events in multiple spaces. 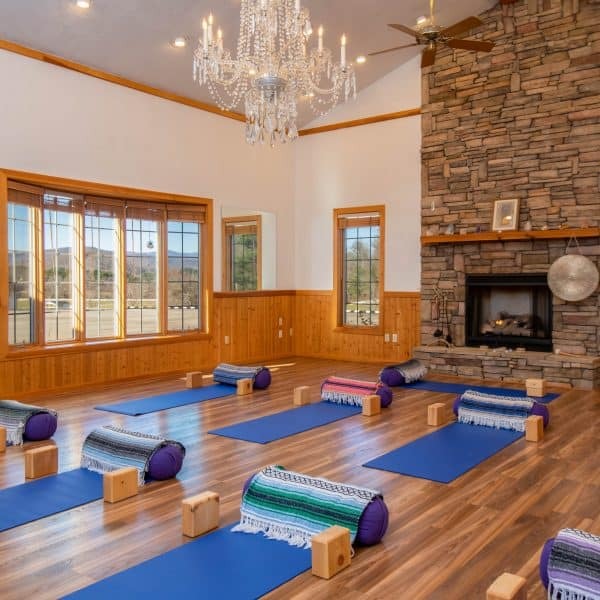 A truly perfect yoga retreat venue! 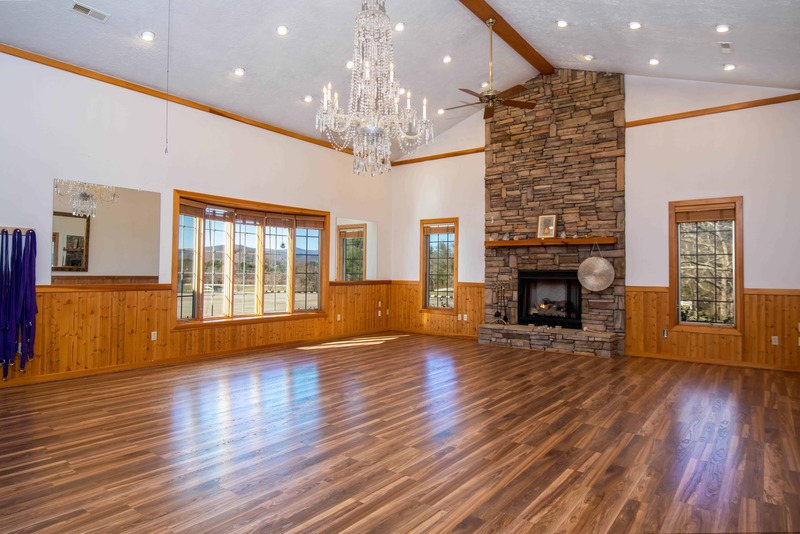 “The Horse Shoe Farm is located only ten minutes from Asheville Airport, when you arrive into the serene beauty of the Farm, the calming river sounds and fresh air scent you immediately feel tranquil and relaxed. Time stands still and your life outside The Farm dwindles and seems far away. The accommodations are simply gorgeous, fresh linens and soft towels in your bedroom and bathroom feel just like home. 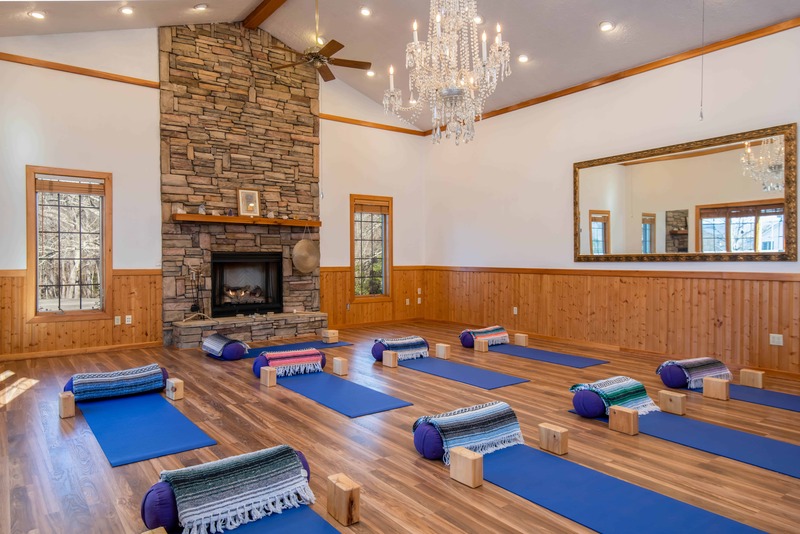 The Staff are amazing and attentive, The Yoga Sanctuary even has a magnificent fireplace to make you feel cozy and warm while practicing. The food was healthy and delicious and prepared with love. I highly recommend that if you just simply wish to get away from the grind of your daily life, lead a Retreat or Celebrate a Wedding or Special Event that The Horse Shoe Farm is for you. Whether we come together as a tribe for a personal growth retreat & workshops, to make music around a drum circle, or you enter the space solo- for a self-connect sanctuary session, the Sanctuary space is our Wellness offering to you from our hearts. 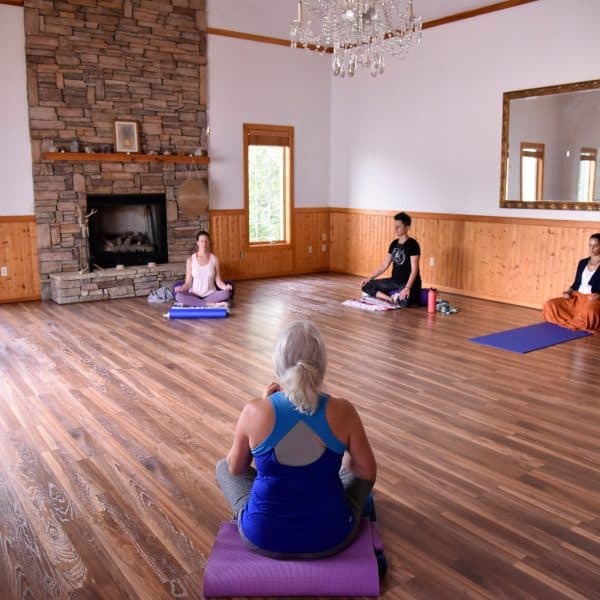 The Sanctuary is perfect for retreat groups, corporate workshops, and other personal growth & transformational events. For more information on hosting your event and retreat packages, contact us to check availability and receive a quote at info@thehorseshoefarm.com.